Here is some art glass we have on display in our antiques and art mall in Southwest Florida. We showcase pieces from Steuben Glass, Lalique, Bacarrat, Waterford, Swarovski, and more. Below we have a small sample of fine glass works of art displayed in our mall. Come by and see our extensive collections in person. We buy Art Glass! If you have pieces you would like to sell or want help establishing the value of your glass treasures Contact us! 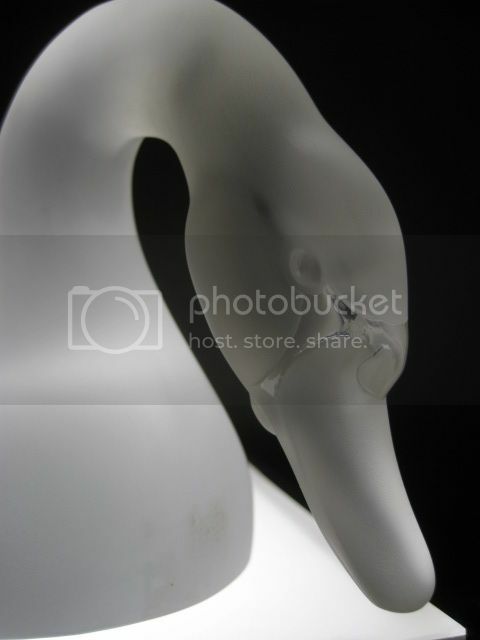 This is an amazing Lalique Crystal swan we just got in. Its in great condition and just one of the fine pieces of art glass we have in our antiques mall. 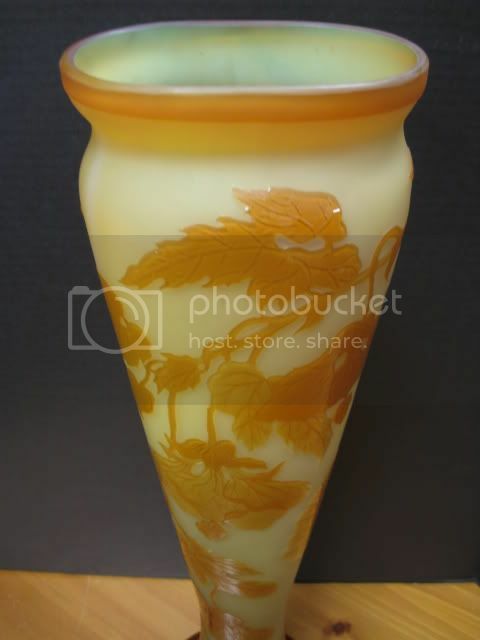 Emile Galle Art Glass Cameo Vase! 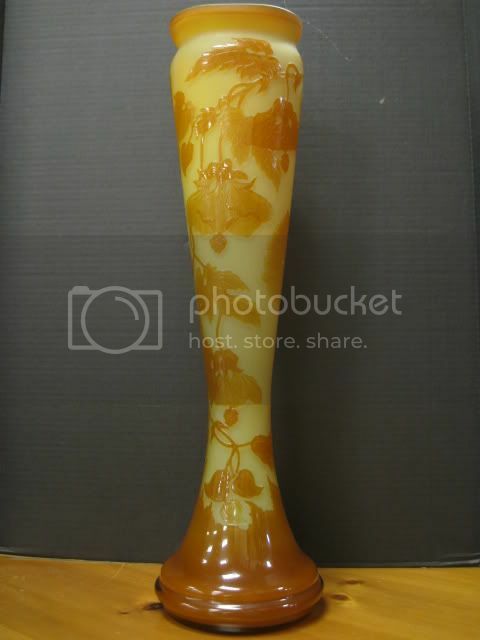 This is a beautiful Emile Galle art glass cameo vase that has just come into our antiques mall. It's one of the largest original Galle pieces we have had and it's in great condition. 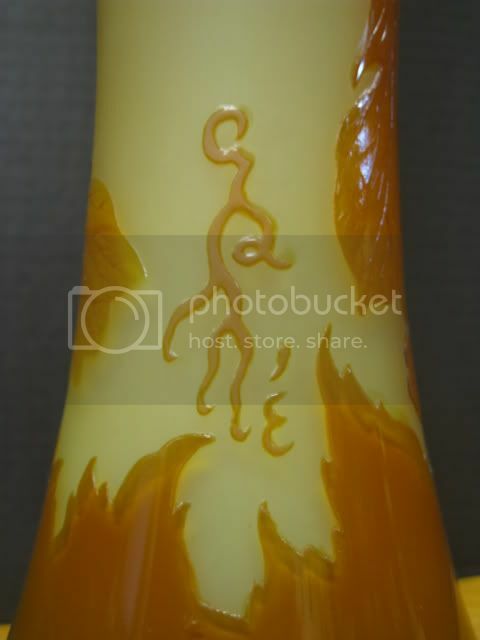 This cameo art glass piece has wonderful shades of rich amber and deep orange colors. We also buy art glass and offer free appraisals. Art Glass from our antiques mall! Here's a very rare collection of fine art glass from our antiques mall. This case has Tiffany favrile glass, Steuben Glass, Weller, and other well known art glass makers. 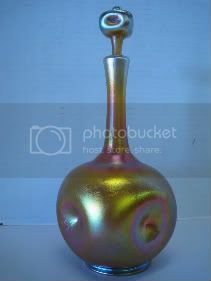 This is a very nice Tiffany favrile iridescent decanter we have in our antiques mall. The glass topper is original and numbered to match the decanter. Including the Tiffany glass topper this set stands 11" tall and looks great. 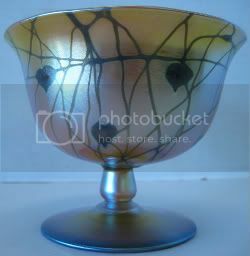 Tiffany Art Glass Favrile Compote Beautiful deep rich colors on a footed base and well marked. This piece stands 3 7/8" tall and the top has a diameter of 6". Great piece to add to any collection. 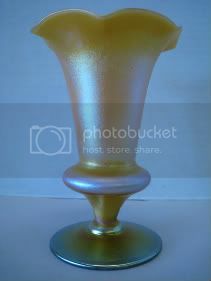 This is a beautiful vase in great condition. It stands about 6 1/8" and has a very ornate rim and amazing colors. 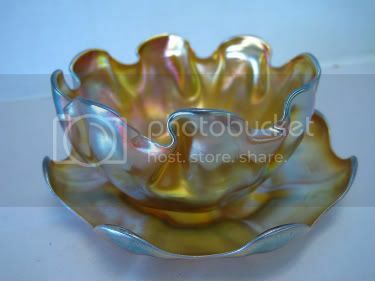 Tiffany Gold Favrile Bowl & Dish, Art Glass Both pieces are in great condition. This is one of the best sets we have seen. Each piece is beautiful and looks great. Sale $895.00 Click here for more details! 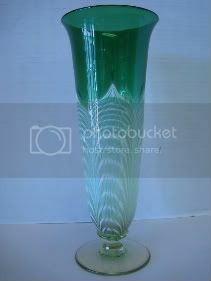 Durand art glass pulled feather vase. 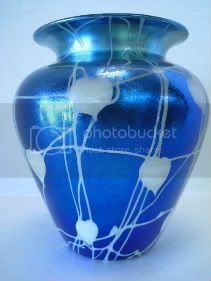 This is a beautiful signed Durand vase. As you can see it has vibrant greens and white through out. This vase is in great condition and stands about 11 7/8" tall and the top's diameter is about 4 5/8". 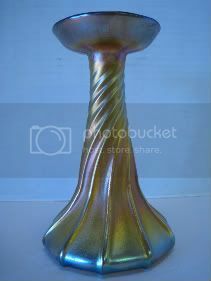 This is a very nice Tiffany art glass piece from our antiques mall. It's in fine condition and stands about 7.25" tall. 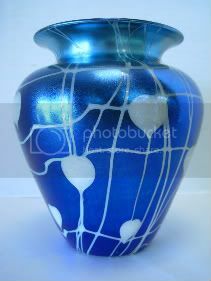 Durand Vase Hearts & Vines, Art Glass Beautiful royal blues and rich purples in great condition. Very nice iridescent piece that looks great in person. Sale $795.00 Click here for more details! Durand compote in great condition with all over vines and hearts. Stands 4.25" tall and the top had a diameter of 5.25". This piece looks nice and will make an excellent addition to any art glass collection. Watch our video on this piece of art glass Antique epergne! This is just one of the nice pieces we have on display inside our showroom. You can also see our art glass we have on our online store! Our Orient & Flume Collection! 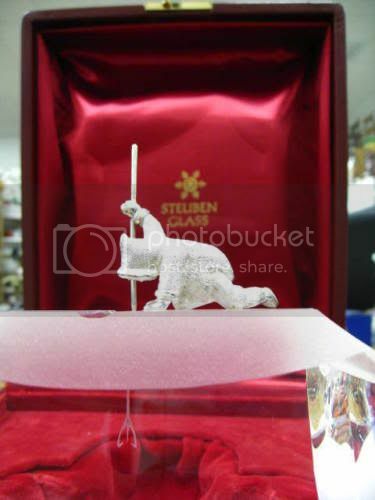 This a stunning crystal work of art by Steuben artist James Houston. This piece is in excellent condition and comes in Steuben keepsake box. This beautiful creation measures about 2.5"X4"X6". James Houston is a Steuben Artist known for his work depicting arctic life and this is a perfect representation of just that. Inside our antiques mall we have a large collection of art glass pieces. You will be able to find an assortment of styles and glass mediums. The names we have displayed are as diverse including Llaque, Steuben, Waterford, and more. We also buy art glass and offer free appraisals. Come to Gannon's Antiques and see what we have displayed inside our 20,000 square foot antiques mall for you. 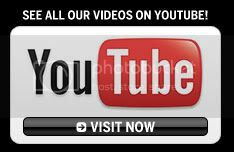 Go from Art Glass to Gannon's Antiques Home Page!